What do 28 people from Canada, Thailand, Paraguay, Mexico, Brazil, Kenya, Benin, and Togo all have in common? What could bring people of such diverse backgrounds together in the remote, almost forgotten town of Gramado, Brazil? 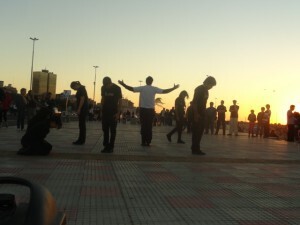 What could send them on the streets of nearby Porto Alegre and engage people in spiritual conversations in spite of the language barrier? Contrary to popular belief, DRIME does not stand for “drama” and “mime” (DRama+mIME?DRIME). It is an acronym (hence always entirely capitalized) for Disciples Ready In Mobile Evangelization. Somebody who does DRIME is a DRIMER but the plural of DRIMER is DRIMERs. A band of DRIMERs in an area is a DRIME team and they perform dramas, not drimes (or DRIMES), never mimes. There are DRIME bases (international home bases from which operations in that country originate) and DRIME chapters (the local DRIME teams) and there is one thing that unites all of these lovely people: the powerful, universal, timeless message of the cross. This message has ignited in each of them a passion to flock to the streets of the world and tell the story of Jesus Christ. Founded in 1994 in a small dorm room in the smaller Northwest Bible College, DRIME boasts a formula that combines evangelism with street drama performance that can be carried to public squares, small alleyways, popular parks, church buildings, and performance halls. At its most basic element, all you need is a boom box. The dramas present moving tableaux that break language barriers and share the message of the gospel in powerful, unique and relevant ways. From very early on, DRIME was committed to equipping the Church to using their dramas, holding “workshops” first in the Lower Mainland, next across Canada, and before long internationally. 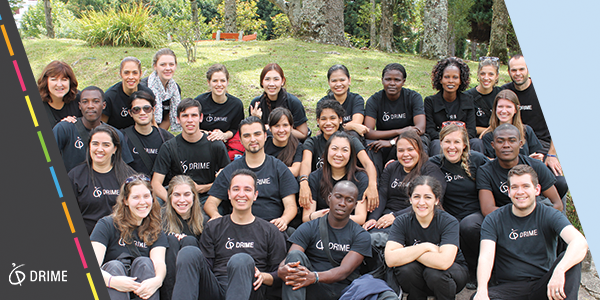 As the ministry continued to grow, DRIME’s mission became international. Today, there are eight DRIME bases around the world and fourteen chapters. Covering a wide range of topics, from simple logistics most of the leaders never had access to (fundraising, budgeting, time management…), to leadership training (understanding the leadership pipeline, personality assessment…) to ministry training (vision, drama training, follow up guide…). The week was designed to empower DRIME’s leaders in their ministry, to provide them resources to thrive individually and to grow as leaders, and to inspire them to dream and fulfill Vision 20:20. Check out some highlights of the week. Vision 20:20 consists of empowering base leaders to become spiritual multipliers and launch 20 new chapters by 2020. Since the previous leadership Summit in 2012, already eight new chapters have been added. Vision 20:20 is not about growing DRIME’s ministry. It’s about making Jesus inescapable on every street corner around the world. 28 leaders, 14 cities, 8 countries, but one ministry, one vision, one message that is the resurrection of Jesus Christ — this is unity through diversity. And so must conclude this very brief curriculum on DRIME. Let me wrap up by saying, DRIMERs are some of the most friendly, wonderful people you will ever meet. Knowing one will enrich your life. They love to be contacted, liked, and followed. If you would like a socioeconomics lesson on DRIME, please click here.